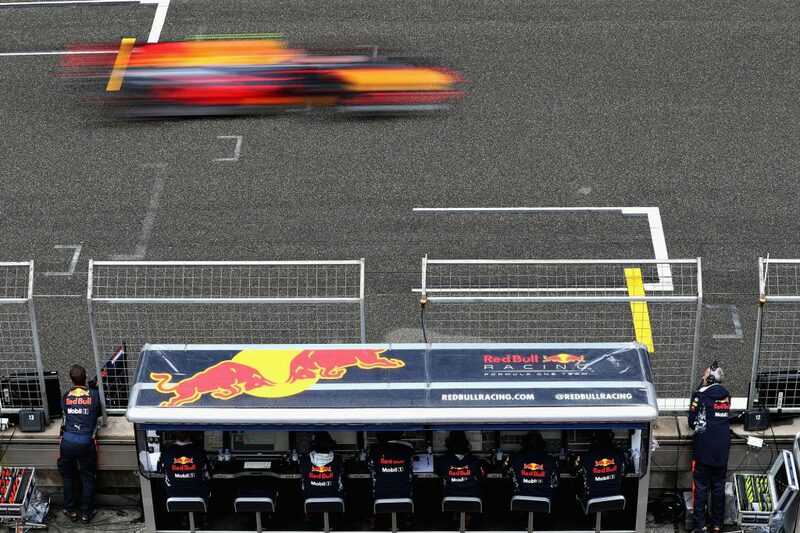 Chinese GP F1 Strategy Report Podcast – our host Michael Lamonato is joined by Peter Anderson from CarsGuide.com.au. 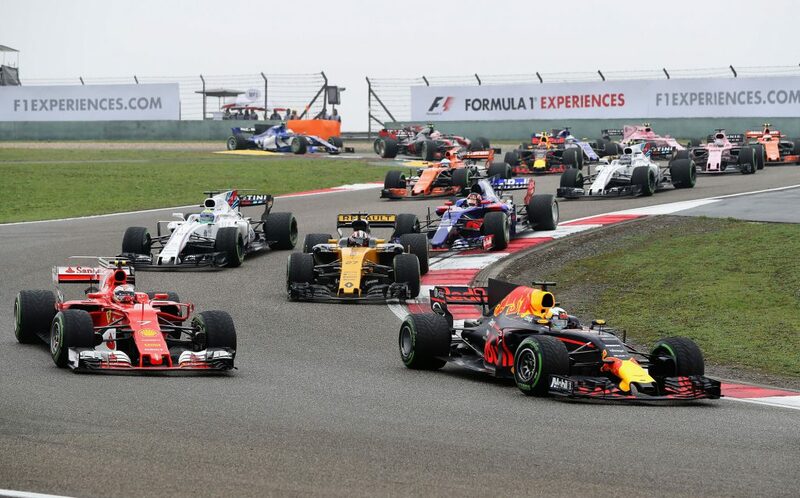 The Chinese Grand Prix was packed full of action and drama, from clashes and crashes to great overtakes and close battles. It wasn’t the most fascinating strategic race, but the changeable conditions and drying track in the early laps threw up some interesting points. Lewis Hamilton scampered off into the distance to take his first win of the season, fifth victory in China and 54th triumph of his Formula 1 career. Sebastian Vettel was in second, running out of time to chase the Mercedes down, with Max Verstappen a charging third after starting 16th. Rain earlier in the day meant there were damp but drying conditions for the start of the race. The pit straight was particularly slippery, with some standing water, but most of the track was a lot drier. However, 19 of the 20 runners opted for the safe choice and start the race on intermediates. Carlos Sainz Jr. was the only driver to start on slicks, going for super-softs. He said Toro Rosso thought he was “mad” for choosing to gamble but despite an awful start and early spin, it actually proved to be worth it as the Spaniard moved up the order through the opening pitstop phase. It put him in a good position for the remainder of the race and he eventually finished seventh. At the end of the first lap the virtual safety car was deployed to clear Lance Stroll’s beached Williams, following contact with Sergio Perez. It presented an interesting strategic opportunity because the track was drying fast and it offered a chance to ditch the intermediates early. Nico Hulkenberg pitted at the end of lap one, while Vettel, Kevin Magnussen, Perez and the McLaren duo of Fernando Alonso and Stoffel Vandoorne were just a few of the people who switched to slicks on lap two. Sadly, though, it didn’t pay off because the safety car was deployed just a few laps later and wiped out the advantage they had gained. The majority of the pack actually pitted under the virtual safety car, apart from the front-runners – Hamilton, Verstappen, Daniel Ricciardo, Kimi Raikkonen and Valtteri Bottas. They all stayed out longer and switched to dry tyres when Antonio Giovinazzi crashed heavily on the pit straight. Diving into the pits at the end of lap five as the rest of the field circulated at a slower pace was a massive boost. The other drivers had already stopped and were also struggling to heat their tyres, which gave those stopping under the safety car even more of an edge. 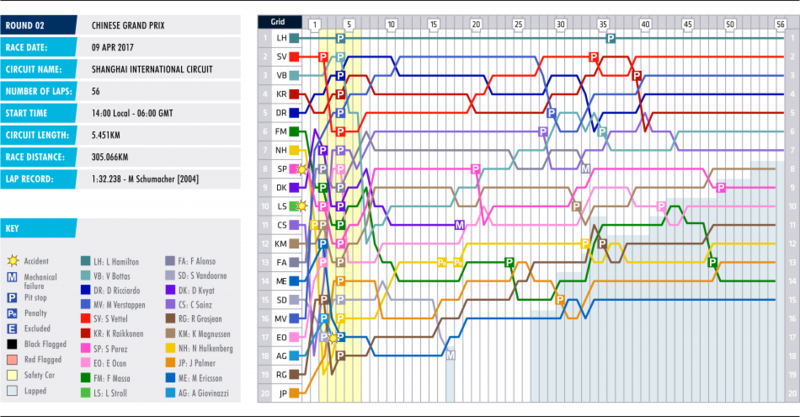 Hence why Vettel dropped to sixth. Bottas lost out in this stage with a slow stop, falling to fifth. Friday’s running was quite simply useless, they only managed around 20 minutes of on-track action due to the red flags for visibility. That left just Saturday’s FP3 and qualifying to get to grips with these new tyre compounds in time for the race, so everyone went into Sunday with a lot of questions needed to be answered. But, unknowns can often throw up exciting races. Through Saturday’s running it was clear Red Bull is a decent way off Mercedes and Ferrari, so going for a two-stop strategy in the race was an interesting one. The team committed early by going from intermediates to super-softs, and then going for the same compound at the second round of stops. It’s possible the team wanted to go for a more aggressive strategy to try and make up for some of the time lost through pure pace, and it certainly worked for them. The super-soft was also used heavily on Saturday so there was more data, and it proved to be a good match durability wise against the soft. Verstappen’s opening lap onboard is a must-watch and a great example of being aggressive on the opening lap. He picked off car after car, going from 16th at the start to seventh by Turn 16, and the Dutch driver kept up that style through the race – helped by two final stints on the super-soft. But that perhaps came back to bite him later on when he began struggling with his tyres. Team-mate Daniel Ricciardo suffered earlier on but came into his own, perhaps through not being quite so aggressive and stopping a few laps after Verstappen. The fight for P3 went down to the wire but Verstappen just finished ahead. Kimi Raikkonen’s Chinese GP wasn’t particularly inspiring, but it definitely wasn’t helped by Ferrari returning to their poor strategy calls of the past. They kept him out longer than rivals for his second stop and his soft tyres were struggling by the end of the stint, meaning he was losing a few seconds per lap at times. It put him on the back foot for the final stint and he ran out of laps to challenge the Red Bulls, finishing within sight of a podium. 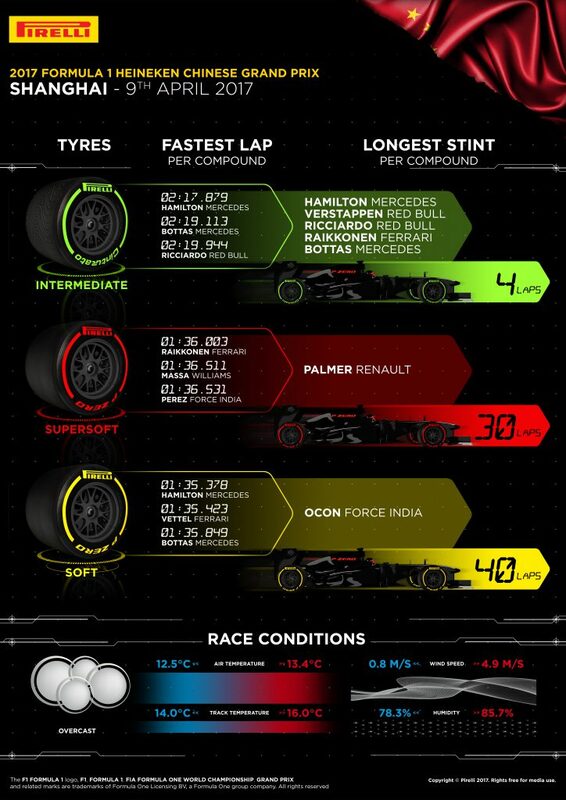 The soft and super-soft tyres looked pretty durable after Saturday’s running, so the medium was never really going to be used. 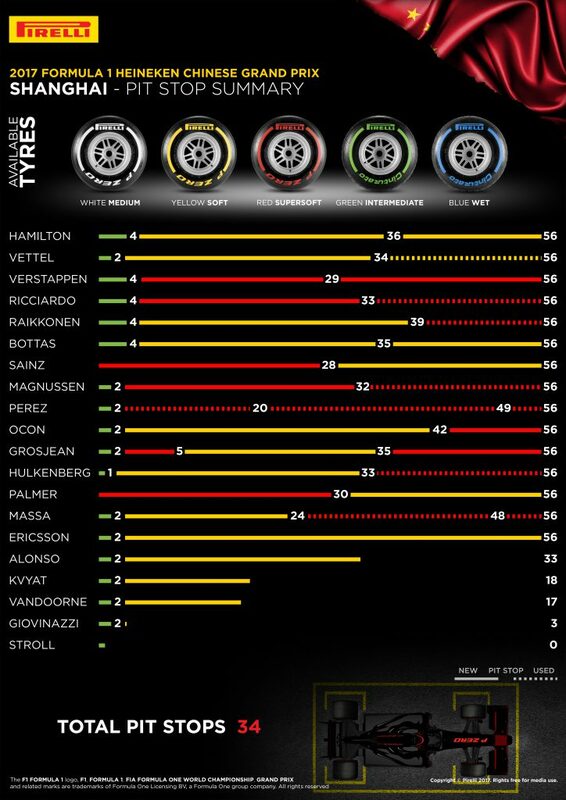 It became clear a few teams were seeing if their drivers could one-stop, having moved onto the softs after the early switch from inters. But that was asking a bit too much of the softs and the teams bailed on that decision during the stint, going for a second stop. Marcus Ericsson was the only driver to one-stop but it did his race no favours and some who stopped during the VSC even had to three-stop, including Perez and Romain Grosjean. The most laps completed in the race on super-softs was 30 (Jolyon Palmer) and the most on softs was 40 laps (Esteban Ocon).